What is a Montessori daycare or preschool? Are they better or worse? What is a Montessori daycare or preschool, and are they better or worse than other programs? When looking for a daycare or preschool for your child, you might hear a lot of terms that describe different programs for enrolment. And likely, you’ve heard of Montessori. Montessori is a popular teaching method that doesn’t only cover early childhood education years. It can go as far as high school. However, in this article, we’ll focus on the daycare and preschool aspects of Montessori education. 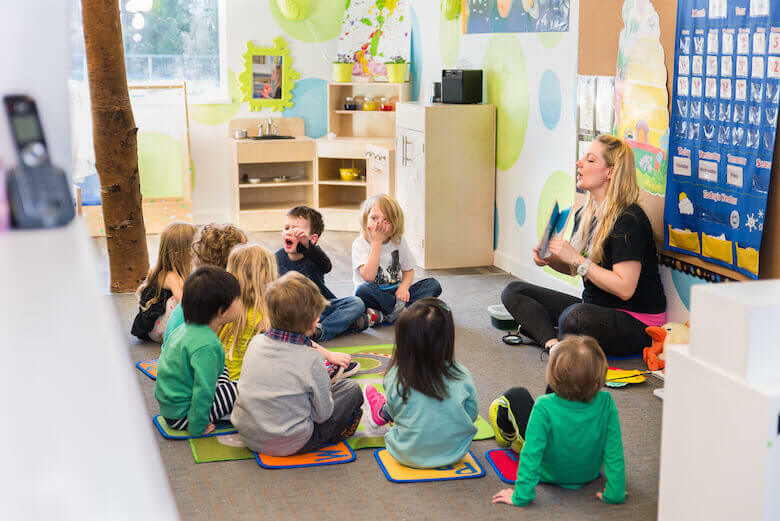 We’ll attempt to answer the question, “What is a Montessori daycare or preschool?” We’ll also attempt to help give you facts to decide if Montessori programs are better than others. What is Waldorf education and why does it matter when choosing a daycare? This is an important point to start with, because many schools can hang their shingles and call themselves a Montessori program. It is more descriptive than official, or trademarked. And due to that, not all Montessori programs may be created equal. If ‘pure’ Montessori matters to you as a parent, you will need to do your research to understand the preschool curriculums of individual schools. You’ll also want to confirm that the teacher conducting the class is trained in Montessori methods. One way to find a reliable source for somewhat ‘regulated’ Montessori programs is through associations. In Canada, we have the Canadian Council of Montessori Administrators (CCMA). There are other organizations that help to set standards for Montessori education, such as the Association Montessori International Canada, the North American Montessori Teacher’s Association and others (including around the world). There are also training centres that specialize in Montessori training, such as the Montessori Training Centre of British Columbia. Also, since the name Montessori describes a theory and not necessarily an official trademark, it can be applied in both public and private school programs. One thing you’ll notice as a parent is that a Montessori daycare or preschool does not require all children to be doing the same activity all together, or all at once. Maria Montessori, the founder of the educational method, believed that children should find their own interests and pursue them without interruption. So, in a Montessori daycare, for example, you’re likely to find interest-based stations, such as the reading nook, or the math area. They can be ‘alone’ areas, or open group areas. And the daycare or preschool kids are given 3 hours per day to focus on what they want to focus on. They can then master the skill they are perfecting. But this does not translate to chaos. There are rules in the classroom, such as remaining calm and quiet, to be able to focus. The good behaviour of children is thought to be a result of allowing independent learning. A trained early childhood educator needs to prepare the classroom so that it is conducive to this style of learning. A lot depends on the teacher in Montessori theory of education. The teacher must be ready to encourage each child individually, so they can learn at their own pace. There are no ‘right and wrong’ answers in Montessori – the child simply needs to direct their own learning, and advance at their own pace. Mistakes are ok, and are seen as part of learning. A minimalist-style, child-sized classroom, without distractions like over-the-top colours, or cluttered shelves. Though, this doesn’t mean no colours. Of course, there is more to it, and we encourage you to do more research on the educational method and how it is carried out, when choosing a daycare or preschool, to decide if the program is right for your child. Some parents love the Montessori program, while others may have complaints about it. For example, this mom who believes it’s not a great option for boys, given their natural desire to be over-active. Multi-age groupings are also an outstanding feature of Montessori education, and are thought to lend to the social ambitions of the program. For example, learning to get along with others, see other people’s points of view, and so on. The idea that older kids can help the younger kids is of course a pro. But not only that, the multi-age grouping can provide more of a ‘homey’ feeling to the classroom – much like siblings would normally play together at home and learn from each other. The age range within a classroom can depend on the ages being taught, or on governmental regulations or limits. And again, we should emphasize that since Montessori programs are not regulated, the rules in any area can differ from school to school. To provide a full disclaimer, as a daycare centre in Metro Vancouver, we are not an official Montessori program. We are purposefully not, having considered many methods to employ in our considerations when implementing our own unique preschool curriculum. This is not to say that Montessori is a less-qualified way of teaching – that’s not it at all. We have found that Montessori, like all the other theories of early childhood education, have their bigger strengths and lesser weaknesses. And in the end, there is a lot of overlap between them all. The interest of the child, is of course, at the heart of any daycare or preschool curriculum method. The important thing is that your child can thrive in the environment they are put in. And sometimes, the rigidness of sticking to one program’s educational theory can be less flexible in that regard. Montessori principles can be seen in many daycare centres. Like the child-sized furniture, or ‘free time’ to learn. Emergent curriculum and following a child’s interests can also be seen in Montessori theory. Social interaction and community responsibility is encouraged in most daycare programs. Many childcare centres are also inclusive of multiple age groups. It is no secret that many early childhood education theories benefit from each other’s ideas. So, whether or not to choose Montessori? This is not something we can decide for you. However, given the information above, it is important to know the principles that make a Montessori program genuine, and how to spot those features in other programs. For example if distance to a childcare centre is a concern, you may be well satisfied with a program closer to home, that has many Montessori principles, but is not necessarily calling themselves a Montessori daycare or preschool.